I've had so much content to post that I'm kind of a bit behind with Christmas, which has given me time to try everything! I'm not one for posting much about gifts - mostly I don't receive many but my relationships are more valuable than any gifts, (No slating anyone who likes to show off their presents, you do you!) The gifts I received this year were all so thoughtful and useful - mostly socks and pyjamas (which I live in), so I just have to share with everyone. 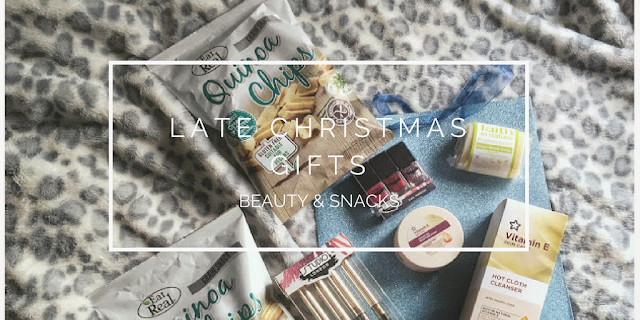 As it's January, and Veganuary, I thought I'd kick it off with a vegan and cruelty-free post featuring two of my favourite things - budget make-up and skincare, and snacks. All of the following products are CLEARLY labelled vegetarian and vegan, as well as cruelty-free, to make shopping that much easier - thanks Superdrug! First up, as you can see in the main image - snacks. The Eat Real range is available in Holland and Barrett and some other retailers, but I rarely see them anywhere else. They have loads of flavours and they start from about £1 depending on the bag size. These Quinoa Chips are my favourite - they go very well with hummus! They are vegan, gluten-free and very addictive. They do some chilli and lemon flavour shells I think which are equally as amazing. Next we have some products from Studio London who are a brand I've seen but not taken much notice of, I don't know why but I just assumed they wouldn't be vegan - WRONG! Cruelty-free and vegan. I believe these can be purchased in Superdrug, I'm unsure on pricing or availability as these were gifts but I'm sure they were under a tenner for the glitter liners and nail varnishes. I rarely paint my nails because it flakes off and then looks minging, but sometimes a good nail polish is welcome. I used these straight away - the pink one and the pink glitter one. They are standard nail varnish and I don't think much more needs to be said. The liners are fun! I find the applicator a little flimsy, but I use them over the top of black liner so it's really no drama as I'm just topping up. They stay well and it's nice to have a few colours. I love Superdrug's Vitamin E skincare range it is so purse friendly, there is a wide range of products and best of all - yup, cruelty-free and vegan. I have the day moisturiser which I use every morning and night moisturiser which I use when I remember (my skin is quite good, so I can get away without it regularly), the gentle eye-make up remover to get rid of my eyeliner and the hydrating mist which I use in the summer when out and about and not wearing make up. There are so many other products in the range I'm keen to try so I was so pleasantly surprised to receive the hot cloth cleanser and leave on mask. They were so easy to use, don't have a strong scent and left my skin feeling amazing. All of the products in the Vitamin E range are £5 or under and very often they have a buy one get one half price, or 3 for 2 offer, so keep an eye out! Oh, and Joshie picked out a Faith in Nature Pineapple & Lime Handmade Soap which I am yet to try - but it smells so good! Thank you so much Jess, Gary, Josh and Adam for these gifts - they were so thoughtful and appreciated! I look forward to a breakfast date again soon. So as you know, I started a new job this month, which sadly meant leaving my beloved old job - where I've worked twice and will no doubt end up back at again one day. My boss, Charlotte, is the bomb, she has always been so supportive and understanding of me and my health (both physical and mental) and has always been the kindest. From the company, I was gifted these two items from Lush - the Pearl massage bar and Princess dusting powder. I've not used either of these items before so I was super excited to try them (and thankful not to receive bath bombs as I only have a shower). Thank you so much for your kind thought and love over all of the years, mama. They both smell amazing - the Pearl massage bar smells sweet and floral but not overpowering. It's made with shea butter, argan and rose oils so it is super moisturising and so lovely after a long day. Princess dusting powder also smells light and refreshing and is lovely to sprinkle on after a shower and moisturising. I also like to sprinkle a little on my wheatbag bunny as it's quite a calming smell before bed! I think I'm gonna try wearing it with my roll on deodorant too as I've heard it can be quite nice there. Phew - I think that's it? This went on a little longer than I anticipated, so I hope I didn't bore you.